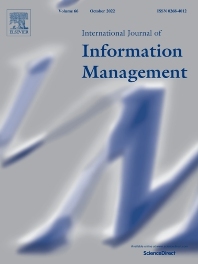 The International Journal of Information Management (IJIM) is an international, peer-reviewed journal which aims to bring its readers the very best analysis and discussion in the developing field of information management. • Is topical: Viewpoint articles and other regular features including Research Notes, Case Studies and a Reviews section help keep the reader up to date with current issues. • Focusses on high quality papers that address contemporary issues for all those involved in information management and which make a contribution to advancing information management theory and practice. Information is critical for the survival and growth of organisations and people. The challenge for Information management is now less about managing activities that collect, store and disseminate information. Rather, there is greater focus on managing activities that make changes in patterns of behaviour of customers, people, and organizations, and information that leads to changes in the way people use information to engage in knowledge focussed activities. Information management covers a wide field and we encourage submissions from diverse areas of practice and settings including business, health, education and government. Aspects of information management in learning organisations, health care (patients as well health workers and managers), business intelligence, security in organizations, social interactions and community development, knowledge management, information design and delivery, information for health care, Information for knowledge creation, legal and regulatory issues, IS-enabled innovations in information, content and knowledge management, philosophical and methodological approaches to information management research, new and emerging agendas for information research and reflective accounts of professional practice.